I visited Light Show at The Hayward Gallery, yesterday. It's been on a while, and I'd heard good things. Normally I end up wanting to visit an exhibition just as they finish (e.g. the recent Museum of London one about dissection ended the day before I decided to go. Doh!) While it may be one of those theme park style exhibitions where everyone wants a 'go' on the different rides - I mean, artworks - it was worth seeing. 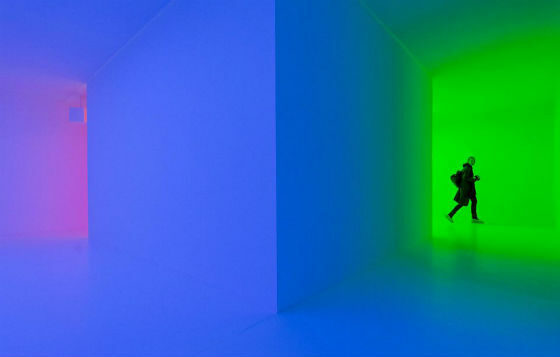 My favourite pieces were by Carlos Cruz-Diez Chromosaturation, 2008.
and by Conrad Shawcross Slow Arc Inside a Cube IV, 2009.